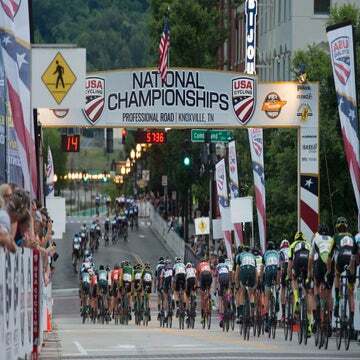 Floyd's Pro Cycling attracts domestic heavy hitters with enthusiasm for "multi-surface events" and a solid infrastructure. The domestic racing team that had the best off-season did not exist three months ago. Floyd’s Pro Cycling has assembled what appears to be the most well-rounded roster within the small circle of North American Continental teams. The Canadian-based squad has North America’s most versatile sprinter in Travis McCabe, a duo of talented GC stage racers in Serghei Tvetcov and Keegan Swirbul, and a cadre of strong veterans and promising youngsters who can help the squad contend at any race on the calendar. The team launched in October, combining funding from Floyd Landis and infrastructure from the now-defunct Continental team Silber Pro Cycling. A confluence of different factors, including a focus on off-road racing, helped the new squad lure the talent. The team has not finalized its racing calendar, but Floyd’s is expected to ride Canada’s Paris-Ancaster gravel race, and Fraser also mentioned Dirty Kanza, Crusher in the Tushar, and possibly the Belgian Waffle ride as options for 2019. The different races, when matched with the team’s commitment to the traditional domestic road calendar, helped some riders commit to the squad. For McCabe, an opportunity to race the Whiskey 50 mountain bike race — the first stop on the Epic Rides series — was especially appealing. McCabe hails from Prescott, Arizona, host town for the race. Swirbul, 23, said that Fraser’s involvement with the team was another draw to joining the squad. A veteran of the domestic racing scene, Fraser retired in 2005 and helped operate a series of domestic racing teams, including team Competitivecyclist.com and, more recently, Silber. “I don’t know him that well, but I’d heard through the grapevine that you don’t want to mess up when he’s directing, and that’s a pressure that I like,” Swirbul said. The chance to race alongside a few other big names also attracted riders. Hearing that Tvetcov and McCabe might sign appealed to Swirbul; Tvetcov and McCabe were also in touch with each other while considering their options. McCabe had hoped to stay in the Pro Continental ranks, but conversations with Israel Cycling Academy and Rally Cycling did not bear fruit. His options came down to a return to Holowesko, where he raced in 2016, and a jump to the new Floyd’s team. He ultimately made the tough call to sign on with Floyd’s, with finances playing a role. New contracts made for a happy ending to what had been a hectic offseason. Swirbul, McCabe, and Tvetcov each saw their teams close their doors at the end of 2018. Hitting the transfer market alongside so many other suddenly jobless riders was not ideal. After months of uncertainty, signing a deal was a relief, to say the least. That season will likely begin for the team in March at the Tucson Bicycle Classic and then the Redlands Bicycle Classic. After that, Fraser hopes to gain invites to the Tour of Taiwan and Tour de Langkawi. With the Amgen Tour of California no longer an option for team’s racing at the Continental level, Fraser sees the Larry H. Miller Tour of Utah as the “cornerstone of the second half of the season,” assuming the team is invited to that event. The team has yet to finalize its calendar of off-road races. Fraser said the team’s primary goal at those races is sponsor visibility, with Landis’s cannabis brand and bike sponsor Van Dessel enthusiastic about having visibility at those events. McCabe said he wants to be competitive wherever he lines up. That shouldn’t be a problem on the road, considering his talents, but he’s not counting himself out in the dirt either.